I sat happily among the choir seats in the chapel on Sunday morning. Our family had completed its annual Christmas Day tradition of breakfast cereal and gift opening. (Each child gets a personal box of whichever cereal they most desire.) Gifts had been enjoyed and all had had plenty of opportunity to indulge in a broad variety of holiday treats. We had managed to get everyone through the shower and properly dressed and groomed in plenty of time for church. Those of our children that were not in the choir were seated with their two grandmothers on the second row of the chapel. So all was good. The choir director handed out a flyer outlining the Christmas program for our worship service. I was, of course, quite familiar with the five numbers the choir would be singing. But I also saw on the program two numbers of which I had been previously unaware. A talented soloist was singing a number and the Primary children would be singing Angels We Have Heard On High. I wondered how the children's number would work out, logistically speaking. We have enough children in our congregation that they would fill the choir seats. It would make for an odd spectacle to have the choir members move out temporarily while the children sang. But the director said nothing about the matter, so I assumed she knew what she was doing. She did. And so did the children. When the moment arrived, the children throughout the congregation stood in place as the director led them in singing this familiar Christmas hymn. Ordinarily the children in our congregation sing this hymn with tremendous gusto, but this performance was rather weak. From my vantage point in the choir seats I saw many of the children that would normally be singing powerfully singing rather timidly. Some seemed to be so horridly embarrassed to be standing at all that they stood uncomfortably without singing. One of the reasons you can get more volume from a group of singers standing near each other is that each derives confidence from his fellows as they identify together as a group and can more easily hear each other sing. Unless one is a particularly confident singer, standing apart will make him feel like an individual rather than part of a group. It was a powerful and sweet experience for me that will become a cherished Christmas memory for years to come. My wife and I both grew up as dog owners. But throughout our marriage we have managed to refrain from owning fur bearing pets of any kind. Until now. It's not that our kids haven't pestered us for pets of various kinds. They have. And we have had pets—mostly fish and amphibians. But, as my kids have frequently reminded me, you can't really cuddle a fish. The level of interaction with a fish in an aquarium is far different from that of a pet with which you can hold, talk to, and play with. Although I have Multiple Sclerosis, I work very hard at maintaining the best level of health possible. Years ago a series of studies looked into the affects of pets on the health of people with MS. From my study of the research, it seemed to me that fur bearing house pets somewhat adversely affected the physical progress of MS, but that those that had pets were psychologically happier. I surmised that I'd rather be able to continue to walk, talk, and provide for my family than enjoy the warm fuzzies I felt as a pet owner. Of course, it is quite possible to have an outdoor pet. But most residential outdoor pets end up in the house sooner or later. So for years we demurred each time a child would put forth arguments for getting a fur bearing pet. A couple of months ago, we discovered that pet ownership can be beneficial for people that deal with certain challenges faced by my youngest son. My boy immediately latched onto that as license—or more correctly, a prescription—for getting a "real" pet. Given that it would have to be an outdoor pet, that meant something like a rabbit, cat, or dog. I didn't think much of this to begin with, but then I noticed that my wife was giving the matter serious consideration. She was doing real research into various pets. My son was consulting closely with friends and neighbors that were pet owners. I immediately started putting up arguments for why we should maintain our long-term policy of not welcoming fur bearing pets into our home. Pets can impose a rather significant expense on a family's budget. I repeated my longstanding arguments against owning such pets. But I privately told my wife that if we had to get a pet, it would have to be a dog. I get along just fine with cats. But I am not a cat person. My wife agreed. But she could see the chink in my armor that translated into tacit approval to get a dog. Soon more members of the family got into the research. They were exploring various breeds and checking for availability of puppies. At first they were looking at mini Dachshunds. While this breed doesn't shed, it seems more like an indoor breed. Eventually they were looking at hardier outdoor breeds. Some family members liked the Shiba Inu breed, which originated in Japan. It was my understanding, however, that this breed can tend to be somewhat ornery. Then my oldest son discovered a breed that was a cross between an American Eskimo and a Shiba Inu called an Imo-Inu. This breed can live outdoors, doesn't get too big, is not too noisy, tends to have a decent temperament, and self grooms. 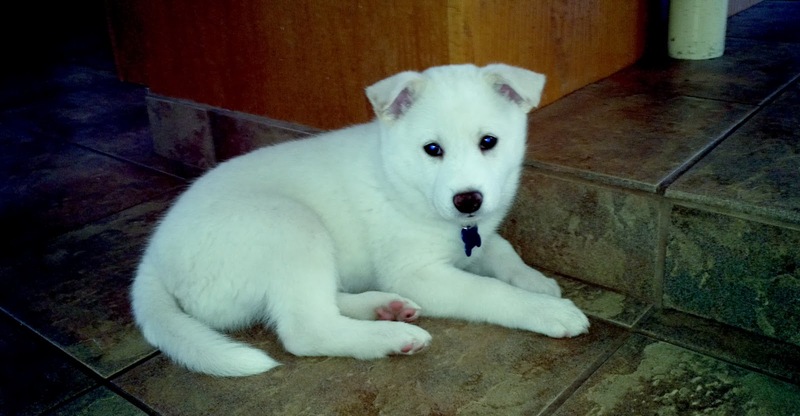 Before long, my wife located a family with a litter of six Imo-Inu puppies. She, my youngest son, and my daughter recently visited this family and returned with an eight-week-old puppy that is mostly white. Per my oldest son's suggestion, the dog has been dubbed Shiranui—a Japanese term for Will-o'-the-whisp. But in the instance cited by my son (who is a fan of Anime), Shiranui means White Star and is ascribed to a legendary white wolf that performed a heroic deed. We've only had the puppy for three days. Although he seems to be quite smart and is doing fair at eliminating outdoors, he has already tinkled on the carpet a dozen times. As I predicted, we have already spent loads of unbudgeted money for shelter, food, shots, toys, etc. Our whole family's schedule is now being controlled by caring for a puppy. And the dog is inside the house a lot of the time. But the puppy has already captured the hearts of every family member. Including mine. I have attended many junior high and middle school band and choir concerts over the years, including the years in which I played in school bands. Most of the performances at these concerts have ranged from extremely awful to tolerable. But that's to be expected. After all, we're talking about beginning musicians for the most part. Last night I had the pleasure of attending the band concert at my son's charter school. It was a vast departure from the normal fare offered by band students in his age group. But in the 3+ years our children have been attending this school, we have come to expect a higher level of excellence. Although most of the students in the beginning band had never played a band instrument before school began this year, they played remarkably well last night. I'd say that they did at least as well as any 'advanced' junior high band I have heard in standard public schools. The advanced band was actually quite superb. While Utah's charter schools are public schools, they function differently than schools in standard public school districts because they minimize administration and overhead in favor of focusing resources on the students. Charter schools are usually too small to offer some of the features available in standard public schools, but they also offer many opportunities that simply don't exist in those schools. My son's band director handles all music related duties at the charter school he attends. She elicits a high degree of quality from the students. It is interesting to watch how well even young children enthusiastically step up and perform songs at school events (sometimes even in foreign languages). This music teacher is demanding, but the students obviously respond well to her methods. Of course, it is rare for a Kindergartener or a middle-schooler to have a music teacher that has master and doctorate degrees in music, has been a professional symphony orchestra musician, can play many instruments, and can relate well with children. Musical teachers of that caliber aren't often found teaching children in public schools. I suspect that it's more of a labor of love for this music teacher, as she obviously has opportunity for greater earning and notoriety outside of this venue. Another son began studying band with this same teacher a few years ago before transitioning to a junior high where he played in the advanced band. Before long he dropped out of this band because its general quality was far below the beginning band at the charter school. He simply couldn't stand it. He transitioned to choir. That turned out to be great, because the choir director was energetic and demanding. Sadly, she moved on to a different school this year because my son's school cut back on funding for music programs. The new choir director is a very nice lady. She has tremendous vocal talent. But once again, my son has gotten to where he can't stand the class because his new teacher seems incapable of demanding excellence from her students. It's amazing what students will do when excellence is demanded. Lack of this reduces student motivation. I have noticed that the percentage of students involved in choir and band has dropped off since my day. I think that part of this is because students now have more options available than we did a generation ago. Perhaps this has diffused funding to the point that schools are less able to pay for quality music instruction. Some argue that arts funding should be pulled from public schools completely in favor of focusing on core curriculum. Given the deplorable state of student performance in core subjects even while greater focus and funding have been directed at those subjects, I am dubious that this would prove to be a productive approach. Especially in light of the fact that IQ universally improves in students that engage in music. If the argument is that parents should fund musical and arts instruction themselves, then let me have part of my tax dollars back and let my children spend more time away from the school so that they can get this instruction. After all, having students spend more time on core subjects at school isn't helping. Since I won't get my wish, I will be happy for now that my charter schoolers get high quality musical instruction. I will also continue to make sure that my kids can take private music lessons—even if they sometimes grouse about practicing. I love music, but I don't listen to recorded music very much. The other day was an exception. As I drove down the road flipping through channels, I found nothing in which I was interested. Finally I landed on a station playing music that was benign enough that I didn't find it obnoxious. Soon I was listening to a love song where the artist was singing about his love interest being his "dream." This made me think about my dreams in life. I can honestly say that all of these years later, my wife is still my dream. A few years ago I wrote a poem for my wife suggesting that we have become so intertwined that she is involved in every thought that I think. My wonderful wife is a grand match for me. She inspires and uplifts me. She puts up with me and helps me be better than I could ever be without her. While my wife is my dream, my dreams expand in multiple directions. My children are my dream. It is tremendously fulfilling (and sometimes tremendously frustrating) to see them grow and become more themselves. My work is my dream. I am blessed with a good job that employs creative and technical skills. Interestingly, I had no idea during my youth that I had interest and ability in these kinds of skills. These developed over time. My spiritual life is my dream. It is difficult for me to publicly address this issue because it is so sacred to me. Mere words cannot adequately convey this sentiment. But it occupies a significant measure of my life. My country is my dream. The older I get the more things I see wrong with my country. But I also see much that is right—some things that are more right than ever. I dream of this place still being a great place for my children and their children in the future. As we decorated the Christmas tree over the weekend, my daughter pulled out an ornament that includes a timely message: "The most important things in life ... aren't things." The more I think about it, the more I realize that my dreams are not really wrapped up in "things," but in matters of much deeper value. It has taken me years to understand—and admit—that I am addicted to carbohydrates. All foods are broken down into three basic nutrients: protein, carbohydrate, and fat. Most foods consist of at least some of all three nutrients. Of course, the balance of the three differs. An apple, for example, is mostly carbohydrate, but it also contains a small amount of fat and protein. Regular peanut butter, on the other hand, is about two-thirds fat, two-ninths carbohydrate, and one-ninth protein. While all carbohydrates are ultimately broken down and metabolized as simple sugar, the higher the complexity of the carb, the longer the metabolism process takes. A longer metabolism time reduces blood sugar spikes. Excess carbs in the system from these spikes not only cause moodiness, they are quickly and easily converted to stored fat. Knowing that there are "good" and "bad" carbs, it should have made sense that the relative healthiness of fats and proteins is also on a sliding scale. That understanding came over time. Eventually my diet morphed to where I focused on eating a balanced set of nutrients at each meal—a moderate amount of protein, carbs, and fats. I tried to eat high quality nutrients. But even when I was doing this, I struggled to maintain optimal weight. I also struggled with cravings and binge eating. What I craved most was carbohydrates. When I would take a dietary 'vacation' for a meal or two, I would go crazy eating all of the treats I had been denying myself. It was only after going on a low-carb diet that I began to lose those cravings. It was only as these cravings began to subside that I realized how addicted I have been to carbohydrates throughout my life. My addiction cycles matched those of people addicted to other substances and behaviors. Joshua Yelon has notes that "Sugar makes your brain release beta endorphin, a chemical with effects like Valium." Rats in tests used sugars and opiates interchangeably. Like smoking, carb infusions relieve stress. But carbs also lend to fat storage. Not everyone responds to carbohydrates as strongly as has been my case. Our body's management of substances is strongly tied to both psychology and physiology. Given that no two of us are exactly alike in these ways, no two of us respond precisely the same to any substance. For that reason, there is no effective one-size-fits-all diet. I don't know what will work for you. But I have discovered that significantly reducing carbs—both complex and refined—in my diet helps me feel better and more readily enables me to manage my weight and body composition. Like all recovering addicts, I still crave the treats that I deny myself. But the cravings aren't as strong as they used to be. On rare occasions when I sample some of these foods, I find that they aren't nearly as satisfactory as they once were. Quite honestly, that's psychologically frustrating. I have very deep-seated memories of how I felt when I ate these foods. Now when I indulge, I get nowhere near the physical or psychological pleasure that I once did. Sometimes it seems like a violation of my memories. I have found that having strong goals helps me maintain a defense against the yearnings for carbohydrate-rich foods that I suspect will be with me in one degree or another throughout my life. Is my current diet the apex of my journey of dietary self discovery? I doubt it. Given my track record, my understanding and practices will likely continue to evolve. A couple of months ago I wrote about the challenges of moving my Mom out of her home of 50 years. Mom had such difficulty dealing with the emotional side of the move that she ultimately opted not to look for a new home until she was out of her old home. After staying with a relative for a few weeks, Mom started to get tired of living out of boxes and suitcases. She longed for her own home. This caused her to get serious about her wants and needs. Having looked seriously at homes in another part of town, Mom determined that it would be best for her to live close to the area where she had lived for decades. That's where her support system was. Fortunately, this decision helped us focus on what was available in the target area. Mom looked at a number of homes. The more anxious she became for getting into her own home, the more she was willing to compromise away desires for some unnecessary features. After getting somewhat serious about a home that was far larger than she needed, a home just a few houses away came on the market. It was a lovely, relatively new home in a planned community. While it lacked certain features, it looked to me and my siblings like the perfect place for Mom. After considering the matter for a couple of weeks, Mom made a reasonable offer on the home, about 2.2% below the asking price. The one drawback was that it was a short sale. That is where the sale of the property will garner less than the outstanding loan balance and the owner cannot afford to pay the deficit. In essence, the lender agrees to take a loss on the loan. In a short sale, the lender becomes the main party that has to be pleased. The property 'owner' may agree to the sale, but the deal only becomes binding when the lender agrees. The process of getting agreement from the lender can be long and painful. However, the real estate agent handling Mom's offer was certified to handle what is known as distressed property transactions. She had been in contact with the lender and had priced the home according to her understanding of what the lender would accept. Mom started to get antsy after a couple of weeks went by. We pestered the agent, who pestered the lender. (We were not permitted to know who the lender was.) After four long weeks, the lender made a counter offer of 3% MORE than the original asking price—more than 5% higher than Mom's offer. Moreover, the lender said that this was the final offer and that no counter offers would be entertained. At first Mom was furious. She was ready to tell the agent that the deal was off. But I knew which other homes were available in the area. Certainly another acceptable home would eventually become available, but there was no telling when that would be. I also knew that even at the higher price, the home was still an acceptable value. It wasn't a super deal, but it was in line with market rates. I urged Mom to put emotions aside and consider the value of the deal based on cold facts. She admitted that under those conditions the deal made sense. It was also the quickest way Mom would get into a new home. Mom's anxiousness to get into a new home outweighed her anger at the situation. Since Mom didn't need any financing to buy the home, the deal closed in rapid fashion. We have spent the last few weeks moving Mom into her new home and reducing the amount of stuff in storage. Just changing her address with all of the places with which she does business has been quite a chore. Mom has given away a fair amount of furniture that won't fit in the new home. She has bought a few items of furniture. And we still have two storage units that are full of stuff. Some of that may end up in the new home someday. But some of it will never go there. I'd like to say that we will eventually clear out the storage units, but Mom is still quite attached to some of the things that she won't end up bringing to her new home. We might have at least one storage unit for years to come. This whole episode has been quite an adventure. And it continues to be so. But at least Mom is in a home that is better suited to her current condition. It's in a great neighborhood too. So it's not a perfect story. But it's pretty good. The first three words a scout promises are, “On my honor.” This is such a common theme that the term “scout’s honor” has been embedded in the English language as a way to denote ultimate truthfulness. Personal honor indicates far more than being true to others; it means being true to oneself. Someone that is internally honorable has no difficulty being publicly honorable. The first time I went to Boy Scout summer camp at age 12, we hauled our own food far into the back country. The troop’s provisions were put in the “food tent.” Since we had to obtain all of the food in advance, we didn’t have much in the way of immediately perishable stuff. We lived on canned and boxed foods throughout the week. While we enjoyed our time at camp, we all looked forward to Saturday morning breakfast, which we would consume as we broke camp. The fare for that morning included commercially packaged pudding in individual servings. This kind of product was relatively new on the market. As such it was a rarity for most of us boys. About the middle of the week, someone found two empty pudding containers in the bushes at the edge of camp and brought them to the senior patrol leader. He inspected the food tent and found that the containers had indeed come from the troop’s stock. This presented a problem because there was only one container per person. Everyone in the troop denied culpability. So, under the direction of our scoutmaster, an investigation was undertaken. Our scoutmaster was a criminal investigator by profession, so it didn’t take long to discover the culprits. As part of the investigation, each member of the troop was brought privately before the troop leadership council and asked to swear to the truth of the matter on his honor as a scout. We didn’t realize at that time that they already knew who had taken the pudding. When one of the culprits was asked to swear on his honor, he immediately confessed, although, he had earlier denied to the group. Despite having stolen, he took the matter of personal honor seriously and he accepted the consequences for doing so. Scouts are to promise to do their best to do their duty to God and country, to obey the Scout Law, to help others at all times, and to maintain high levels of physical, mental, and moral rectitude with a profound sense of personal honor. This proposition is at odds with many of today’s cultural currents. Personal honor is still widely respected, but it is not much pursued. As private integrity recedes, we struggle as a society to invent increasingly stringent policies designed to impose proper behavior. All of these external approaches are poor and failing substitutes for the genuine article. But there is a reason that people still revere personal honor. Society works best when people have it. While the broader culture pursues a ‘whatever’ approach to morality, Boy Scouts promise on their honor to be moral actors. Of course, they are youth that are just learning. But when the aim is high, the result is likely to be much higher than when the target doesn’t exist at all. I was painfully aware as a young scout that most of the other scouts in my troop had far more physical and athletic prowess than me. It seemed to me that almost all of the other scouts were just better at pretty much everything we did in scouts. From my current vantage point I can see that my perspective at that age was grossly skewed. The vast majority of young people feel inferior to their peers in many ways. Each assumes that his feelings of loneliness and inferiority are somewhat unique, when in fact they are the rule rather than the exception. Scouts promise in the Scout Oath to do their best to fulfill the points outlined in the oath. My youngest son once remarked to me that his older brothers were all better at scouting than him. I laughed because I knew what his brothers were like at the same age. He was comparing himself at age 11 to boys that had earned the Eagle Scout rank and had spent summers working on Boy Scout camp staff, but who at age 11 were much like him. I also explained to my son a simple principle that took me a long time to comprehend. When he promised to do his best, it was HIS best he was promising to do, not someone else's best. We are each blessed with a rather unique set of strengths and weaknesses, challenges and opportunities. We are weak and lazy when we excuse ourselves from trying to do things at which we know others to be better. Besides, in doing the things at which we aren't proficient, we increase our ability to do them. As a young scout I knew the square knot pretty well, but not many other knots. Lashings mystified me completely. At age 17 I spent the summer teaching the Pioneering merit badge at scout camp. By the end of the summer I had become quite expert at a variety of knots, lashings, and rope splices. These skills remain strong with me to this day. Interestingly, when Delose Conner hired me to work on camp staff all those years ago, he didn't ask me how good I was at pioneering skills. Instead he gave me the resources I needed to be successful and he expected me to step up to the challenge. He expected me to do my best. He knew that as I did so, my best would become better. He knew that by the end of the summer my best would be better than my best at the beginning of the summer. When scouts stand and promise to do their best, they are in essence promising to become better. At age 12 I hiked with my troop to Beula Lake in the Yellowstone back country. From the trail head the hike is less than three miles. The first quarter mile or so is uphill, but it's relatively level after that. Despite the hike's ease, I trailed behind the rest of the troop both on the way in and on the way out. It's kind of funny, but I was never much interested in physical exercise as a kid. It wasn't until I worked on camp staff in my older teen years that I began to discover joy in hiking and backpacking. Yet I stuck with the scouting program for years as we repeatedly went hiking and camping. One of the purposes of all of that hiking and all of the physical games we played was to help promote being physically strong and active. This is one of the elements of doing one's duty to self, the third part of the Scout Oath. I think it is worthwhile to note that duty to self comes only after duty to God and country, and duty to others. While attending one scouting event my troop was presented with a challenge. A number of items were placed under a blanket. The blanket was lifted for just a few seconds, revealing the items. Then we had a minute to specify what and where each item was. The goal was to correctly observe as many items as possible. This simple game is known as Kim's Game. Robert Baden-Powell, the founder of scouting felt that this was a very useful game to play to teach young people to be mentally keen. Baden-Powell also used tracking and other activities to teach youth to be sharp observers. Part of the reason for this is that well trained young men had helped him during some of his military campaigns. But he felt that being keenly aware of surroundings could be useful in every setting. One of my friends in my troop when I was a boy seemed uninterested in being clean, pure, and honest. The more I got to know him, the more I felt that he really only cared about himself. He had no problem with bending the truth, being cruel to others, or leaving others to clean up after him if it was to his immediate advantage. I later had a friend who was, as they used to say, a straight shooter. He was without guile. He looked like a nerd, yet everyone loved him. He was as honest as the day is long and he was a genuinely good individual. But he could interact easily with just about anybody, even the kids from the 'parking lot' crew. No one questioned his moral rectitude. Nor did they try to dissuade him from it. The first friend I mentioned liked scouting, but he wasn't too keen on living scouting principles. The second friend I mentioned was a scout. He didn't just attend meetings, he embodied what it means to be a scout. This is what I think of when I hear scouts repeat the term, "morally straight." According to the Scout Oath, doing one's duty to self embodies working toward physical, mental, and moral health and well being. Proper care in these areas enables one to more fully accomplish the other promises made in the Scout Oath: to do one's duty to God and country, to obey the Scout Law, and to help other people at all times. On my honor, I will do my best ... to keep myself physically strong, mentally awake, and morally straight. Years ago I was at an Order of the Arrow event at Camp Kiesel. The youth were playing a camp-wide game of capture the flag. The camp occupies the juncture where two narrow canyons intersect. The boys decided that one team's turf would be Dry Bread Hollow, while the other team was assigned to Wheat Grass Canyon. This setup proved to be quite challenging. Boys from both teams were easily captured as they tried to move through the common area of the camp between canyons. Suddenly someone from the Dry Bread team came running into the lodge, reporting that two boys were stuck on a ledge high above the canyon. Apparently the boys had tried to climb over the top of the mountain to get from Wheat Grass to Dry Bread so that they could approach the other team's flag from the rear. They successfully scaled the mountain, but on the descent into Dry Bread they slid down to a ledge with a dangerous drop off. There was no chance for them to move laterally or to climb back up they way they had come. Several of us ran up to the location to assess the situation. Nowadays we have plenty of trained individuals and climbing gear around, so a rescue of this nature could easily be affected. But back in those days we didn't have that kind of training or gear. One of the older youth, Doug Hopper, knew just what to do. He quickly recruited a crew of strapping 17- and 18-year-olds. Within a few minutes, they were on the canyon wall above the stranded climbers. Doug had the crew form a human ladder. He was the guy at the end of the ladder that trusted the others enough to risk his life to pull the younger boys to safety. I have always remembered Doug's bravery and willingness to help. These are two qualities that all scouts promise to implement. Doug had a career as full-time military as a flight instructor. As a full-time commercial pilot, he now serves in the reserves. One of the car's rear wheels was hanging in free space. A mom and two kids stood off to the side looking anxiously on as the father sat in the driver seat revving the engine and trying to keep the precariously positioned vehicle from sliding over the edge. Delose immediately pulled off and got out to see how he could help. It was suggested that the van could be used to pull the car back onto the road, but they had no tow straps. Then one of the staffers suggested that they simply pick up the car and put it back on the road. As the adults in the situation balked at that idea, the staffers gathered around the car, picked it up, carried it a few feet, and put it down on safe ground. Delose quips that you can accomplish anything with 15 teenage camp staffers. Scouts promise when they recite the Scout Oath to help others "at all times." This means helping when it's not convenient and helping even when no one has organized a service project. It means being aware of how one can be helpful and doing what one can do to help others. Like other scouting principles, helping others implies a degree of selflessness. On my honor, I will do my best to ... help other people at all times. When I was a Boy Scout, I one day saw one of my fellow scouts wearing a shiny metal band around his wrist. It showed a name and a date. But it wasn't his name. So I asked him what the wristband represented. At the time the U.S. was embroiled in a very controversial war in Vietnam and neighboring countries. Most of the controversy was lost on me and my friends. We didn't know why we were at war and we didn't know why so many people in the U.S. were so unhappy about the war. At any rate, when I asked my friend what his wristband meant, he explained that the name belonged to a member of the U.S. military that was missing in action. It was unknown whether this man was dead or alive, whether he was a prisoner of war, injured, or whatever. My friend had obtained the band as a patriotic gesture for the cost of a donation. We didn't understand the war, but we did know that it would be good if the individual missing in action could be safely returned home. Maybe the donation could help with that. Several of us soon obtained similar wristbands. At a time when we saw angry crowds on TV burning American flags, our scouting leaders taught us to reverence the flag. We learned how to salute it, how to fold and unfold it properly, how to raise it briskly and lower it slowly, how to display it, how to carry it, and how to post it properly. Every summer I attend several ceremonies at scout camps where worn American flags are burned. Unlike the angry crowds on TV, those performing the ceremonies at camp burn each tattered flag with love and respect for the "republic for which it stands." I have often enjoyed hearing someone at these ceremonies recite Johnny Cash's Ragged Ol' Flag (see video below). But a scout doesn't just promise to love his country. He promises to do his duty to his country. There are many different ways to do that. My best friend from my young scouting days has spent his adult life serving as a naval reserve officer. Although he runs his own business, he has several times left his family and business behind to serve his country abroad. Another friend has done his duty by serving in a state legislature where he fought to reduce unnecessary spending and excess taxes. I have watched for decades as young Boy Scout camp staffers have led scouting groups into the Yellowstone back country, teaching them to love, respect, and care for this cherished national park that they own along with their fellow Americans. As important as is duty to country, the Scout Oath puts duty to God first. I recently covered this topic when I wrote about reverence. The approach to doing one's duty to God differs according to one's beliefs. As a member of the Church of Jesus Christ of Latter-Day Saints, I entered into the church's lay ministry along with most of my scouting friends when I was a Boy Scout. Part of our duty to God entailed serving the Sacrament to the congregation each Sunday, attending weekly church meetings, fasting once a month, collecting fast offerings for the needy, working on the welfare farm where the produce went to help others, and accepting a variety of service callings. Most of us eventually spent two years serving as full-time missionaries for the church at our own expense. I find it interesting that the Scout Oath links doing one's duty to God and his country in the same phrase. Perhaps this is because scouting envisions a certain level of sacredness in both of these endeavors. But I think the main key is the word "duty." Duty means performing some action that we owe. Scouting recognizes that each scout is indebted to his God and to his country for the tremendous blessings of life and opportunity that he enjoys. The word duty implies humility, gratitude, and allegiance to causes greater than the individual. It implies a certain level of selflessness. Another important word in the Scout Oath is "do." A scout promises to do his duty to God and his country, not just to think about it. This promise is one of action. Scouts are to recognize that they have a duty and they promise to do their best to fulfill that duty. Scoutmaster Ken Hill later asked to boys to think carefully about the Scout Law that they had recited and to give their opinion as to which of the 16 words in the law was the most important. He also wanted them to say why they thought that particular word was the most important one. Some thoughtful answers were given. Then Ken asked the boys to consider the possibility that the word "is" might be the most important word in the Scout Law. The law, he noted, doesn't say, "A scout should be ... ," "A scout wants to be ... ," or "A scout tries to be ...." It says, "A scout is ..." all of the 12 principles listed in the law. The law is not a list of goals, but a list of characteristics that define and identify a scout. Of course, all scouting age boys are in training. Each can only be expected to live up to the 12 points of the Scout Law according to their age appropriate abilities. But to be a scout, they are expected to do their best at this. Imagine how much better the world would be if each of us did our best to live these principles in our individual lives—if these words were part of our individual identity. Ken Hill may be right. The most important word in the Scout Law may be "is." I went to Boy Scout summer camp for the first time when I was 12 years old. We arrived on Saturday and set up camp. It rained that night. But the morning dawned sunny and beautiful. After breakfast I went with my troop to church at the outdoor chapel at Camp Loll. Sacrament (communion) was served on trays that were hand carved from local logs. We sat on pews made of logs. Birds chirped as we sang hymns and listened to sermons. I don't remember a word of what was said, but I remember the grand view of the lake and woods from a chapel decorated more gloriously by the Creator than the Sistine Chapel was decorated by the masters. I remember the sense of the sacred that I felt there. Almost all scout meetings I have attended throughout my life have opened and concluded with prayer. I have bowed my head as prayers have been voiced by professional ministers and by rascally Cub Scouts. The common strain in all of these episodes has been scouts reverencing God. Many times I have sat around a campfire as young scouts have expressed their feelings of devotion toward their Heavenly Father. The sacredness of these moments cannot be adequately conveyed using mere words. The Boy Scout Law explains that reverence for a scout includes being faithful in his religious duties and respecting the religious beliefs of others. Once as a teenager I was preparing to go home from an Explorer Scout event when one of the advisers invited us to share a cultural experience. He had been invited to bring a small group of scouts to the home of Roy Nakatani to share in the celebration of the Japanese New Year. The Nakatanis were most gracious as we sampled various Japanese foods, some of which were quite foreign to our uneducated palates. As we visited with the Nakatanis, we came to understand that for them this was also a religious event. Although their beliefs differed from ours, we made every effort to properly honor and show respect for the things they held sacred. Throughout my life I have taken my religion seriously. I have tried to live up to the principles espoused by my religion (although I have often failed). I have done my best to do my duty to God and to follow the observances prescribed by my religion. Although outward religious performances are important, reverence is something that happens within. LDS Church President David O. McKay said that "reverence is profound respect mingled with love" for God. I have felt this reverence as keenly in God's natural chapels as in any chapel made by the hands of man. But I also appreciate sacred spaces built by men to honor God. Their handiwork may not be as glorious as the Father's, but any space set apart for ennobling and sacred worship is divine. After working for several months on the requirements for the Personal Fitness merit badge, I made an appointment with a counselor to pass it off. I met with Jimmy Hill at his home. Jimmy carefully made sure I had satisfied the requirements. He explained to me the importance of physical health and cautioned me to always use protective eye wear when doing projects, as he had once been poked in the eye by a branch when pruning a tree. On another occasion a group of my friends were planning on hiking up in the hills above our homes to a prominent rock feature. I was keen to go hiking with my friends. But when someone said that one of the boys would be bringing some pornographic magazines, I determined not to go. As a young teenager I became an avid skateboarder. I got pretty good at it too (even if I can barely stand on a skateboard nowadays). Back in those days we were able to enjoy the pastime without having to dress or groom ourselves in a particular fashion. We could skateboard without having to take on a 'boarder' identity. Once when I was riding at a fairly popular venue, the only two other boys present offered me a joint. I turned them down flat despite their insistence. I had already learned to just say no to drugs. It dawned on me later that part of the reason they were so persistent about wanting me to join them was so that I wouldn't squeal on them. The Boy Scout Law says, "A scout keeps his body and mind fit and clean." That might come as a shock to those that have gone to camp for a week with scouts or to the mom that does the wash after her son returns from camp. Physical fitness has been part of scouting from its earliest days. Lord Robert Baden-Powell introduced many physical activities on the first scouting campout. Cleanliness has also been a key principle. Performing service projects to help keep communities clean has been and continues to be a key feature in scouting. I have taken part in many Eagle Scout service projects over the years. Many of them have aimed to beautify and improve communities. When I look back on my youth, I realize that I had many opportunities to associate with people that chose low moral standards. But for some reason our ways eventually parted as we got older. I believe that scouting played an important role in my choice of friends. The Boy Scout Law also says that a scout "chooses the company of those who live by high standards." When we have high standards ourselves, we tend to gravitate to others that share those ideals. Positive peer pressure makes us want to rise to challenges and improve ourselves. Today we have more personal hygiene products than ever. We have clothing that resists odor causing bacteria. We have better cleaning supplies and equipment than at any time in history. In short, we have the ability to be more physically clean than ever. But at the same time we have more access to mental filth and it is far easier to be mentally, morally, and physically slothful than ever. In the face of such cultural debauchery, scouting continues to teach boys to be physically, mentally, and morally clean. Years ago several Camp Loll staffers found an abandoned badger den in the forest outside of camp boundaries. At first they prized it for its natural value. Then they came up with more insidious ideas. The staffers found an old badger skin tucked away in the camp gear. Since the den was large enough for a person to hide in, they secreted one of their number inside the hole with the skin. They would then invite other staffers to come and look at the badger den they had found. Just as the unsuspecting staffer went to poke his head into the hole, the boy in the hole would stick the head of the badger skin out of the hole while making an animal-like growl. The jokers would laugh as the startled staffer would run or try to climb a tree to get away. The gag was repeated a number of times until Keith DeHart was the target. Keith happened to be carrying a spear, which was a Native American regalia project on which he had been working. When the badger head poked out of the hole, Keith was just as surprised as the others had been. But instead of running, he lifted the spear, cocked his arm, and prepared to skewer the badger. Fortunately, the jokers put a stop to the activity before someone got hurt. Keith is one of the bravest people I know. Bravery is not fearlessness. It means doing what should be done despite fear. When I was 17 I became stranded on a snowmobile trip in the back country. I had no knowledge of how to repair the machine. I had not been trained to stay with the machine and to engage in activities near the machine that would make it easier for searchers to find me. Instead of backtracking toward the start of our journey, I made the foolhardy decision in the growing twilight to try to follow the remainder of my group that had disappeared over a hill some time earlier. I hiked for hours through deep snow in the darkness in an area totally unknown to me. I was scared, but eventually I saw snowmobiles searching for me. Unfortunately, they bypassed me in the darkness. But I then knew where they had come from, so I did my best to follow their tracks. Searchers finally found me at 2 am a few hundred yards from the cabin that had been our destination. Although I had broken the rules for what to do when lost in the back country (simply because I didn't know the rules), I had done my best to do what I had understood to be right. I faced my fears and forged ahead. A few years ago I watched my oldest son respond to a call to play an important part in a scouting ceremony. He had played a similar role in other ceremonies, but had only seen the ceremony in question once or twice. But the event leaders were in desperate straits. The boy that was scheduled to play the part simply hadn't shown up. Many people would be watching. Moreover, my son prefers to avoid the limelight. Instead of turning down the opportunity, my son stepped up to the challenge. An hour later he was playing the main part in a ceremony that lasted 45 minutes. He was scared. He stumbled over his lines a few times. He often had to read his lines from behind a prop he was holding. It wasn't the greatest performance, but it was passable. My son had bravely done what needed to be done, although, he would have preferred to avoid doing so. When I was young, I was at a scouting event when several boys started talking about pranks they had seen pulled on others. This naturally led to the group coming up with pranks they could pull members of another patrol. The ringleaders in the group began developing some rather elaborate plans that required our participation. I was not one of the popular boys in our large troop. Participating in the pranks would likely have raised my status in the group. But the pranks being discussed felt wrong to me. I squirmed as the ringleaders began detailing the parts that the less popular members of the group would play. Then one of my friends stood up and said, "I'm not going to do that. We are scouts, and a scout doesn't do that kind of thing." Almost everyone except for the three ringleaders quickly chimed in that they wouldn't participate either. Finally, two of the ringleaders turned against the boy that was the driving force behind the plan. I'm sure that my friend was scared to stand up to the older and more popular boys. I'm sure that he had no idea that many others would join him as soon as he publicly took a position against the plan. But he bravely did the right thing anyway. Fear does not excuse one from choosing right. It does not excuse one from the moral obligation to take a stand against something that is wrong. This is one of the principles that scouting seeks to instill in youth. "The problem is that you don't know the value of a dollar," my Dad complained. I had started a daily newspaper delivery route at age 11, so I had a source of income. What Dad didn't like was the fact that I tended to fritter away my earnings on stuff that seemed to have little value. I was, for example, a regular patron of the candy machines at school. When I went to Boy Scout summer camp for the first time, I brought extra money to spend in the trading post. Frankly, they didn't have that much stuff in the trading post. I spent $5 (which was worth a lot more than $5 today) on an old army surplus wood frame for a backpack. What was I thinking? It hung around the house for years, but I never used it. Having grown up in an era of plenty, it took a while for me to develop an understanding of the principle of thrift. Being thrifty involves far more than just monetary matters. One of the early lessons I learned as a scout was to avoid cutting trails. It causes erosion and other environmental problems. I also learned to pack out all trash and to leave places better than we found them. "A Scout works to pay his own way and to help others. He saves for the future. He protects and conserves natural resources. He carefully uses time and property." By the time I worked on Camp Loll Staff, I had become more thrifty. Another staffer and I used some of our limited free time to snorkel around the shallows of the lake hunting for lost fishing lures. (Yeah, that's a cold activity.) We would clean up the lures and sell them in the trading post for cheap. One of the greatest examples of thrift I have ever seen in scouting was a man named Jed Stringham. Jed was in charge of all of the scout council's camp facilities. He would show up at Camp Loll and would work like crazy. I'm not sure I've ever seen a harder working person in my life. Jed was careful about spending the council's money. He was an expert at finding ways of getting things done with available resources. I particularly like the fact that scouts are encouraged to pay their own way. They are not to be freeloaders. If everyone in society did their best to live by this principle, there would be far fewer that need or expect help. And those that did need help would find others offering it. Self responsibility is a necessary element of thrift. One of the first songs I learned when I worked on the staff at Camp Loll as a youth was Stay On the Sunny Side, a goofy ditty that employs a series of knock-knock jokes between rousing renditions of the chorus. We sang it often and with gusto. Despite its silliness, the song makes a useful point about cheerfulness. Everything in life is better when you maintain a cheerful attitude. I once read an article about a series of studies that delved into optimism and pessimism. Pessimists tend to be right more often, the article stated, while optimists tend to be more successful, happier, and longer lived. But the article went on to make a very important point. Pessimists are accurate more often in part because their gloom can become a self fulfilling prophecy. When I joined the Order of the Arrow as a scout, I was intrigued by the organization's internal name: the Brotherhood of Cheerful Service. Members promise to "seek to preserve a cheerful spirit, even in the midst of irksome tasks and weighty responsibilities." This seems to run counter to a culture that encourages people to do whatever they want and to escape negative emotions through addictive substances and activities. Mike was the first patrol leader I remember. He seemed to always be happy. He clearly felt passionate about certain pursuits. I enjoyed joining in some of these activities. (Less so when it came to his enthusiasm for entomology.) Despite his geekiness, Mike was always keen for adventure. I wondered what made Mike tick. After all, my Mom will tell you that I grew up as the pouting champion of our family. I knew how to carry a dark cloud around with me. Over my years of scouting, I have repeatedly encountered people that have helped me understand the value of choosing to be happy and upbeat. When I worked on Boy Scout camp staff, I was impressed by our waterfront director (and chaplain), Gordon Banz. Gordon seemed to always have a way of finding a silver lining in every situation. His cheerfulness was contagious. The gloomy among us may be more accurate about some matters. But they aren't much fun to be around. People tend to naturally gravitate to the cheerful and away from the dour. Much can be accomplished with a cheerful attitude. Elder Jeffrey R. Holland said, "Speak hopefully. Speak encouragingly, including about yourself. ... Yes, life has its problems, and yes, there are negative things to face, but please accept one of Elder Holland's maxim's for living—no misfortune is so bad that whining about it won't make it worse." My cubmaster, Art McKeen started every Cub Scout pack meeting by putting the needle of a record player on just the right spot of a vinyl LP. A bugle calling Assembly sounded out across the gymnasium letting everyone know that the meeting was about to start. We had a very large pack, but when that bugle call sounded, each of us quickly found our seats and the room became amazingly quiet. Art would welcome everyone to the meeting. He was always well organized. The cubs that were to run the flag ceremony were fully prepared by this point. Art would again set the needle on the record and we would hear a bugle playing To The Color. We all immediately stood at attention. The flag ceremony followed. At the close of the meeting, the record player sounded Retreat, following which, we would run to get treats. When I first became a member of the pack, I wasn't completely sure why we did all of these things at pack meetings. But, like my fellow Cub Scouts, I obediently did what I knew I was supposed to do. As time went on I gained a better understanding of why it was important to have order in the meeting and to properly honor our nation's flag. Obedience is an important principle for maintaining safety and order, and in making life more pleasant for everyone. Chaos can be exhilarating, but it is rarely pleasant. It endangers life and property. The Boy Scout Law teaches a scout to be obedient to the laws and rules of his family, school, troop, community, and country. He is to work through appropriate channels to change laws and rules that he thinks are unfair rather than disobeying them. But there are limits to this as well. Obedience, above all, means being obedient to what is right. There may be times when one is faced with the choice of obeying a blatantly immoral law or doing what is actually right. My Dad saw only one movie that was rated R during his lifetime. I expressed surprise when he told me that he took my young brother to see Schindler's List. Having grown up in Nazi Germany, Dad responded that it was absolutely essential for everyone to understand the profound evil that was perpetrated in Germany during that era, while many either participated in or acquiesced to such wickedness in the name of obedience. Consider, for example, how the young German boy depicted as a member of the Hitler Youth in this short video clip chooses to save the life of a Jewish girl in obvious defiance of established law. While obedience to proper authority is necessary in society, no one is obligated to obey laws that are evil. It must be recognized, however, that failure to obey such laws may lead to severe consequences. One must be willing to accept such consequences when it becomes necessary to disobey immoral laws. Hopefully today's scouts will rarely face such challenges and can content themselves with obedience to acceptable laws and rules. We arrived at the spring Camp-O-Ree ready to have some fun. Our patrol had made food and gear assignments in advance. After finding our campsite, the first order of business was to set up our tents. My partner and I got busy doing that, as did most of the other boys. We quickly noticed one set of tent partners relaxing while the rest of us worked. When we asked these two boys where their tent was, they responded that they had decided to sleep under the stars. I cast a doubtful eye at the sky. Even at my young age, I could see that it would probably rain during the night. But, hey, it was their choice. The evening progressed as normal. We built a fire, prepared and ate dinner, and spent the evening goofing around, telling stories, etc. Just as our scoutmaster said that it was time to head off to bed, a few raindrops started falling. The two boys that lacked a tent suddenly looked very concerned. Our scoutmaster inquired as to how much space was available in each tent. All tents were completely full except for ours. My partner had brought a tent that in theory could fit three people. I never believe what manufacturers say about the sleeping capacity of a tent. Their calculations might work for people under four feet tall and weighing less than 50 pounds. Everyone knows that a three-person tent is actually barely suitable for two. As our scoutmaster looked around the campfire, my tent partner suddenly looked at me with big, pleading puppy-dog-like eyes. I knew that he was going to offer our tent. I tried to signal to him that I wasn't feeling very generous at the moment. After all, these boys had made a conscious choice and they should accept the natural consequences of their choice. Nevertheless, my tent partner quickly spoke up and said that the boys could sleep with us in our tent. It was an awful night. The four of us were packed into far too small of a space. It was uncomfortable and I slept poorly. To top it off, the storm ended up dropping only a small scattering of drops once during the night. It was dry after that, and the morning dawned mostly clear. Those guys would have been just fine sleeping under the open skies. But down inside I knew that my tent partner had done the right thing in making the offer. I knew that his act of kindness was the right thing for a scout to do. Kindness doesn't stop with people. The Boy Scout Law says that kindness includes not harming or killing any living thing without good reason. When I was young we went to visit my uncles that lived on the prairies of Wyoming. One Saturday afternoon we loaded up in a Jeep wagon and headed out of town. The men-folk hauled out a variety of weapons and started shooting various critters. Many prairie dogs bit the dust that day, along with a number of rabbits and various fowl. All of the shooters seemed to quite enjoy the activity. None of these animals were taken for meat. Although I recognized that my relatives viewed these animals as vermin, the whole exercise struck me as wrong. The sheer pleasure derived from killing things repulsed me, especially when all of the carcasses were left to rot. I'm sure that my uncles and cousins felt that they were performing a public service. In their minds, they had acted with good reason. All I can say for sure is that it didn't feel that way to me, and I lost all desire to participate in anything like that again. When I heard LDS Church President Spencer W. Kimball give his 1978 speech about not killing the little birds, I felt vindicated. Thanks to a tent partner that was more gracious than me, I saw scouting kindness in action that night camping long ago. I have since seen more acts of kindness than I could possibly count, many of them aimed at me. And I am grateful for each one. One year at summer camp we had a commissioner named Bill, a trim college-age guy with closely cropped hair. Bill was the epitome of organization. His uniform looked great. He was always where he was supposed to be when he was supposed to be there. We could always depend on him to do what he was supposed to do. While friendly, Bill seemed a little too business like to us boys. The commissioner we had had the previous year was a much more easygoing fellow that was easy to joke around with. We had given that commissioner an affectionate nickname that was, uh, less than respectful. He took it all in stride and had great fun with it. We tried to do the same with Bill, but it didn't go over well. One evening as we sat around the campfire, our scoutmaster, Al Parks talked to us about what it meant to be courteous. It was more than just being nice to people. It was showing genuine respect for others. Al said that Bill had treated each of us boys with kindness and dignity. He was right about that. Although Bill seemed a little uptight, he also seemed to reflect sincere regard for even the snottiest kid. Bill had a different personality than the previous year's commissioner. To him, our attempts at playfulness seemed hurtful and disrespectful. Bill wondered what he had done to deserve such treatment at our hands. We were invited to think about how we could more positively interact with Bill. We started joking around about it, but soft spoken Al gently let us know that he was quite serious. So we got serious about how we could have fun with Bill while still showing him the kind of respect he showed us. It didn't take us long to come up with some plans. The rest of the week went much better. We enjoyed Bill. And by the end of the week, he even learned to enjoy our troop. Courtesy is the lubricant that makes for pleasant social interactions. Insincere courtesy may help avoid some social scrapes, but it still fails to convey respect. Real courtesy requires actual respect for others—an inward belief in their innate dignity. My Mom carefully trained her sons in the finer points of courtesy and good manners. We haven't always lived up to Mom's teachings. But we know how to do so. To this day, I open doors for my wife. I do this, not because I think she is weak or incapable, but because I love and respect her. We live in an age where potty humor is greatly celebrated and marketed to our youth. The broader culture teaches kids from their earliest ages that they can get ahead by 'dissing' others—that they can build themselves up by putting others down. But that is not the way of the scout. Scouts are (or should be) taught to see the best within each individual and to treat each person in a way that lifts them toward their best potential. It is more than a way of acting; it is a way of thinking. I had achieved the rank of Life Scout and had most of the merit badges I needed for the rank of Eagle Scout. But then I stalled out on advancement. I was active in my troop, but I wasn't earning new advancements. My friend Cory was in the same boat. Like me, he had climbed to the Life rank, but had taken a breather. One day I noticed that Cory was staying after school. I asked him what was up with that. Was he in trouble? He explained that he was staying after to take a merit badge class from one of the English teachers. I had no clue that this man was a merit badge counselor. Cory encouraged me to attend the class with him. Within a few weeks I had earned several new merit badges and had learned some new skills. I still remember my parents taking me to the teacher's home to pass off the Home Repairs merit badge, among others. Thanks to Cory's encouragement, I got back on the trail to the Eagle rank. I finished the requirements and attended my board of review in the spring of that year. A few months after my court of honor, I was able to attend the court of honor where Cory was awarded his Eagle rank. True friends help us become better than we would be without their friendship. So-called friends that lead us down ignoble or stagnating paths are not friends at all. Throughout my lifetime involved in scouting, I have developed many friendships. Sometimes years—even decades—go by between occurrences of seeing an old scouting friend. Yet I find that these friendships still uplift me. This past summer I encountered a man that I knew as a youth many years ago. He lives across the country. I have heard about him because one of my sons has worked on camp staff with some of his sons. We enjoyed becoming reacquainted and reminiscing about old times. He was a fine individual back in the day and he is a better individual today. What a great experience it was to see my friend again. Being friendly is more than just focusing on close acquaintances. It means showing good will to others, regardless of whether we know them or not. Years ago when I attended a National Order of the Arrow Conference I met a young man named Bob who was from another state. Bob was the epitome of a friendly scout. Bob was great to be around. He seemed to naturally lift those around him toward their better selves. I don't remember Bob's last name or even where he was from. But I remember his friendliness toward me. Ennobling friendship and friendliness are qualities the Boy Scouts seeks to instill in its members. When I was a young Boy Scout, we had among our troop equipment an interesting contraption that allowed us to make rope. It had been constructed by an earlier adult volunteer using old lawn mower gears. The geared contraption was strapped to a scout using a long leather belt. There was one main larger gear that was set in motion using an inline hand crank that was usually turned by the scout wearing the belt. That main gear turned four small gears, three of which had hooks welded onto them. We would run two strands of natural fiber twine from each hook to a distant point, to which the strands of twine would be fixed. We would multiply the desired finished length of the rope by three and station the scout with the belt that far away from the fixed point. At least one other scout was needed to run the 'crow's foot,' which was an iron peg that split at the end so that three prongs could be used to separate the three groupings of twine strands. As the crank turned, the twine strands twisted tightly together. The scout wearing the belt used his weight and strength to keep the strands taut throughout the process. When the twisted strands started to bind on each other, the scout manning the crow's foot would confine the twisted strands to the part of the rope closest to the crank. He moved away from this point as the rope became tighter. When the rope was as tight as we could get it, scouts would whip each end to prevent unraveling and then cut the rope loose from the geared hooks and the fixed point. It took some serious work, but only a few minutes for scouts to make a useful rope using twine. Every scout I knew loved to have a piece of rope they had made themselves. Our new scoutmaster, Al Parks signed the troop up for a rope making booth at the council's Scout-O-Rama. That was a council-wide event that was aimed chiefly at Cub Scouts and leaders, but where Boy Scout troops and leaders could also get ideas from other troops. One warm Saturday in May, our troop spent the entire day helping Cub Scouts make their own ropes. We quickly discovered that few of these younger boys had sufficient strength to keep the rope taut and turn the crank. We provided lots of assistance for hours. At the end of the day when the Cub Scouts were gone, we weren't finished. We had to disassemble our booth, load the stuff onto a trailer, haul it to the owner's lot, and unload it. It was late in the day by the time we got home. We were tired and had given up an entire Saturday that could have been spent in other pursuits. But somehow we felt pretty good about the whole thing. Al explained to us that this good feeling was part of the magic of helping others. We felt good because we were being and doing good. I went on my first overnight hike with the Boy Scout troop just a couple of days before I turned 12. Our family had recently acquired a new 'lightweight' pup tent made of nylon. I was incredibly excited as I looked forward to hiking with the troop. Having never been on an overnight hike, I plied my older brother for help in preparing. He offered generous advice, including a lot of information about preparing for a weeklong hike in the back country. I assiduously put my brother's advice to work, lading my pack with far more stuff than would be needed on an overnight campout. On Friday afternoon our troop gathered in the driveway of our scoutmaster, Bob Porter. It took a while for the adults that would be helping with transportation to get home from work and get ready to take us. But eventually we were at the trailhead that would lead us to Malan's Basin. The first stretch of the hike wasn't too bad. There wasn't much of a climb as we hiked up the creek bed in the bottom of Taylor Canyon. But all of that changed when we came to the spot where the switchbacks started. Being somewhat of a couch potato, I was unprepared for the rigors of carrying an overladen backpack up a couple of miles of trail that climbed a couple thousand feet in elevation. Before long I was at the rear of the pack of hikers. They would stop and rest to wait for the stragglers to catch up. As soon as I would arrive and drop my pack, the main group would head off up the trail, giving me no time for rest. As the hike wore on, I trudged increasingly slowly up the interminable trail, taking frequent breaks and wondering if I would ever make it to the destination. Eventually, I was alone. Alone except for my scoutmaster, Bob Porter. Bob hiked along with me at my slow pace, encouraging, cajoling, and keeping me somehow going as the sun set and the trail ahead began to disappear into the dusk. We couldn't hear any of the rest of the troop any more, but Bob stayed with me. It is true that Bob was responsible for my well being on this trip, but it isn't really possible to go astray on this trail. Once you get going up the Taylor Canyon switchbacks, you will eventually reach Malan's Peak as long as you keep going. Bob could have hiked on ahead and then sent someone back to assist me. Bob could have carried my pack for me. But he didn't. He stayed with me and made sure that I gained the victory of carrying my own pack all the way to the campsite. That's loyalty: devotion to doing the right thing. Loyalty can be misplaced. Some have engaged in immoral acts in the name of being loyal to a creed, nation, team, or person, etc. My Dad saw that kind of thing when he grew up in Nazi Germany. This is a counterfeit for the kind of loyalty promoted by the Boy Scouts of America. Gordon B. Hinckley once said, "I think of loyalty in terms of being true to ourselves. ... We must be true to the very best that is in us." "I once had a boss who said, “Greed makes the world go ‘round”. He was wrong. An ounce of loyalty is worth a pound of cleverness. What makes families and communities and countries work—indeed, what makes the world go ‘round—is loyalty." My earliest lessons in loyalty came at home among my family. But my first lesson in scouting loyalty that I can remember happened on a lonely mountain trail when my scoutmaster refused to leave my side. I learned to build campfires at age 17. By that time I had been an Eagle Scout for three years, had served in various scouting leadership positions for years, had gone on many campouts, and had sat around many campfires. My 18th summer found me working on staff at Camp Loll. One day I was assigned along with several others to build the campfires for the evening program that would kick off a week of camping and outdoor events for a couple of hundred scouts and leaders. I dutifully headed to the campfire bowl with my crew and we began haphazardly throwing together piles of wood in the two fire pits. Fortunately, our camp director, Delose Conner happened to wander onto the scene. (I later realized that he was wisely checking on us.) He looked at our work and asked whether we thought that the fire lays we had built could be started with a single match and whether they would burn nicely for an hour. Assuming that we'd apply some kind of liquid accelerant to the stack of wood, I replied that the fires would start if they were sufficiently doused in "scout juice." After all, that's the way I had always seen campfires built. Delose explained that at Camp Loll we used only natural elements in our campfires and that the use of accelerants was not permitted. My crew and I quickly understood that what we had built wouldn't work. Delose then carefully instructed us in the fine art of building a 'council' campfire. He showed us how to build something that looked kind of like a log cabin fire lay, but where every other layer was a fairly solid floor of wood. We started with larger diameter logs and gradually worked our way up to small sticks. Atop our structure we built a tepee of very dry, thin, long sticks. We filled the tepee with masses of very fine, dry tinder. The fire would start small at the top. As the top layer of sticks burned through, the fire would fall to the next layer. There was enough space between each layer to allow enough air to reach the fuel for the fire to burn well. A properly constructed fire, it was explained, would burn brightly for about 45 minutes and would then diminish to a lovely bed of coals that would provide just the right ambiance as the program wound down. Our director carefully explained that each campfire needed to be completely dependable. He had to be able to trust that the fire would start with a single match, stay lit, and burn as long as needed. The scouts in attendance had to see that it was possible to start a fully natural fire if the fire lay was properly prepared. In short, he said, the fire had to be trustworthy, just as each scout promised to be trustworthy each time he recited the Scout Law. Trustworthiness is something that is proven and earned. Not only must it thrive inside the individual, others must be aware of it as well. It is something for which one gains a reputation. Once trust is violated, it is extremely difficult to regain. My camp director was also the professional scout executive for the district where I lived. He later told me that one of the reasons he hired me to work on camp staff was that I had proven myself to be dependable as a youth Order of the Arrow leader. Delose reminded me that some months earlier our O.A. chapter had agreed to do a camping promotion presentation for a large troop. Weeks later, Delose looked at his calendar and realized that the event was supposed to start in a few minutes. He had no time to remind chapter members. He hurriedly gathered supplies and rushed to the meeting, only to find me already leading the event. Trustworthiness means keeping one's promises. It means being where you have promised to be doing what you have promised to do. It means being truthful, even when it might be more convenient or profitable to be otherwise. And it is the first point of the Scout Law. Our scouting district held a Camporee two weekends ago for Boy Scout units. We now have about 70 such units in our district. I did not expect a huge turnout to the event. We have traditionally gotten much lower turnouts at fall Camporee events than at winter Klondike events. I suspect that there are many reasons for this. The school year has just begun and families are busy. But another reason that I expected a lower turnout was that the new district camping chairman had to go out of town for an extended period for his job. While the camping chairman had done quite a bit of groundwork in setting up the event, his absence in the critical few weeks prior to the event left the program chairman scrambling. Throughout the Friday of the campout the skies were overcast. The forecast called for rain. But the temperature was relatively mild. We have no problem getting troops to come out to camp in the snow, but rain is another story. The threat of a little rain seems to deplete turnout by as much as half. Heavy rain will cut that number in half again. I tell people around here all of the time that if they refuse to camp in rainy conditions, their boys will never learn how to successfully deal with outdoor events in wet weather. I also tell them that if they lived in the Northwest and refused to camp in the rain, they would never go camping at all. It's not the boys that cancel campouts in the face of precipitation; it's the adults. I have to admit that it's a lot of work to dry out wet tents and gear. But I also can't help but wonder if adult scouters have always been this wimpy. I seem to remember camping in wet weather quite a bit when I was a youth. When we held flag ceremony at sundown, we had 17 Scout troops in attendance. 17 out of 70 is rather pathetic. We had somewhere around 150 attendees (youth and adults). While there had been a bit of misty rain earlier in the evening, the weather turned off quite beautiful for our campfire program. It still felt quite nice when we bedded down for the night. But along about midnight it started to rain in earnest. The first troop that couldn't hack it pulled out around 1 am. Over the next couple of hours, a few more pulled up stakes and headed home. Around 5 am we experienced a spectacularly bright and noisy thunderstorm. More troops left then, citing their hazardous weather training. Many of us that have been through (and taught) the same training judged it sufficiently safe to remain. By the time we held flag ceremony at 8 am, only seven troops remained. Scout games were planned for 9 am. By that time, only one troop remained. True, it rained off and on and all the camping gear was wet. It is also true that many boys were quite wet by then. But the one troop that stayed had a great time anyway. After all, they reasoned that they would soon be home and able to get dry. Why not have fun? Listening to conversations as troops packed up and headed home, I think that most of the boys would have stayed if only the adults had let them. I wonder what the boys learned from this. Our Order of the Arrow chapter members were the last to leave after cleaning up. The Camporee had been damp and poorly attended. But dampness need not ruin a campout if campers are properly prepared. Those that learn lessons from getting wet during an outdoor event can learn to have fun in wet weather anyway. Youth safety is very important and should not be compromised. But teaching Scouts to be wimps won't instill the kind of values in them that the Boy Scouts of America seeks to uphold. North Ogden Voters to City Council Incumbents: Get Lost! A few weeks ago I wrote about the kerfuffle in North Ogden over city leadership's handling of the public works facility issue. I noted that about 3,000 of North Ogden residents had signed a petition demanding that the $10 million bond for the proposed facility be put to a general vote. The city responded by filing a lawsuit against two of the sponsors of the petition. Frankly, the mayor and most members of the city council members have demonstrated a disgracefully dismissive attitude toward residents that have concerns about the project, its costs, and the way it has been handled. It's not that their position is without merit; it's that they have treated a fair number of those they supposedly represent with disdain. The city attorney and some of the city's employees haven't helped matters much. Someone should have instructed these people to keep their mouths shut. Instead they made a number of public statements that smacked of an elitist attitude. They seemed to quite forget that they work for the taxpayers of North Ogden, not vice versa. By the time the primary election rolled around yesterday, the cake had been baked. Four years ago when 10 candidates ran for three city council seats, only 866 of the city's 9,532 registered voters went to the polls (as noted in this post). I thought that was pathetic, but not unexpected. The purpose of the election was to winnow the 11 candidates down to six, three of whom will be selected for city council in the final vote on November 8. That meant that five of the candidates had to be eliminated in yesterday's primary election. The three incumbents came in in the sixth, seventh, and eight position. So only one of the incumbents will be on the final ballot. However, it should be noted that the three incumbents together garnered only 18.29% of the vote. Had there been fewer opposition candidates, the opposition vote would have been less diluted and none of the incumbents would have made it to the final ballot. Those that voted in the primary election were pretty ticked off at the incumbents. As I expected, the two candidates against whom the city filed suit came out on top in yesterday's election. The lawsuit was probably the most effective campaign tool for these candidates. In past city council elections, those that came out on top in the primary election have almost always won the general election. I suspect it will be the same this time around, although, something unexpected could alter that outcome. I doubt that the one incumbent that survived the primary election will have much hope of winning the general election. Given turnout in past elections, I doubt we will see more than 600 additional voters show up at the general election. Even if every last one of the additional ballots were cast for the lone incumbent, it is doubtful that she would win a seat. The two council members that lost their bid last night are actually better off than the lone survivor. She now has to go through the motions of campaigning for nearly two months knowing that she will likely lose. In January, the mayor and the city employees will be dealing with a very different city council than they have dealt with in the past. One of the sitting council members is already a strong supporter of limited government. The other guy does not seem to be the type to put up much opposition against a crew that is determined to reign in the city government. If the mayor's seat had been on the ballot yesterday, the incumbent would have lost. Yesterday's vote was as much a referendum on his handling of his job as anything else. But much could happen over the next two years. It will be interesting to see if the mayor decides to run for re-election and what the public sentiment will be if he chooses to do so. In the meantime, one thing is abundantly clear. A very vocal and involved group of concerned citizens isn't happy about being treated as if their concerns are of no importance. City officials need to take a different approach to dealing with these people. Today in church one of the congregational hymns was Improve the Shining Moments. The lyrics of the final verse conclude with the phrase, "And God will love and bless you And help to you impart." Every time our congregation sings this song, many sing, "And help you to impart" rather than, "And help to you impart." I suspect that the word "impart" is mainly to blame for the mix up. If you ask the average American youth what the word impart means, you will likely either get a blank stare or a guess that turns out to be incorrect. Many adults have some kind of foggy idea of the word's definition, but few are sufficiently familiar with its usage to know what they are singing regardless of whether they sing "you to" or "to you." If you know what the word means, I guess that either way presents a good message. If you sing the hymn's actual lyrics, you are testifying that God will give those that rely on him help when they need it. If you switch the words and sing, "And help you to impart," you are testifying that those that rely on God will be helped to help others in their times of need. Either way, it's a good Christian message. About a year and a half ago, I wrote a post about hymns. There are hymns that I dearly love, hymns that are OK with me, some that I prefer to sing rarely, and a few that I would prefer to completely avoid. I noted, for example, that there is a whole section of absolutely dreary hymns in the current LDS hymnal. Personally, I find no comfort or peace from these depressing odes. One challenge with any words that get recorded is that the record stays in its original format while the language of the culture continues to evolve. Without anyone really designing or being in control of language, words and phrases come into being, develop new meanings, and drop from common usage on an ongoing basis. We have all experienced generational differences in understanding of language. Our kids start throwing around terms or usages with which we are unfamiliar. A couple of years ago I heard a teenager say, "Man, that is sick!" From the tone of his voice I could tell that he was expressing approval. When my friends and I uttered the precise same phrase at that age, we meant that something was depraved or highly distasteful. It happens the other way too. Older people use terms that the younger generation doesn't understand. They also user terms that are dated. Although the younger generation understands the term, they don't use it. Usually this means that the term will die out within a generation. Nowhere is the example of time-framed linguistic alienation more clear than in scripture. The LDS Church uses the King James Version of the Bible. This version is noted for its beautiful prose and linguistic quality. It is felt by many that the KJV Bible preserves the original scripture in English better than other versions. But the fact that the translation is more than 400 years old presents a difficulty for modern readers of the scripture. There are many cases where the phraseology differs so drastically from current language usage that it is very difficult to understand without special training. Some words have changed meaning so that some passages read by moderns can even appear to mean the exact opposite of their original intent. A similar condition exists for hymn lyrics. As the language evolves, the phrases and words used in some hymns become unfamiliar to those singing the hymns nowadays. The problem can be compounded by the fact that hymn phrasing may vary from accepted sentence structure in order to achieve the lyrical qualities that make words work with music. But hymns differ from scripture. While both hymns and scripture are meant for spiritual and moral edification, scripture is canonized while hymns are not (except for Psalms). Thus, it is far more acceptable to change the wording of hymns to meet currently common understanding than it is to alter scripture for the same reason. It is completely acceptable to write new hymns and stop using hymns, whereas, this isn't general the case with scripture. Still, it isn't a simple thing for a church with thousands of congregations to switch hymnals. As I noted in last year's hymn post, the current LDS hymnal was published 26 years ago in 1985. The previous edition was published some 35 years earlier. It takes time and resources to change out millions of hymn books. I opined to my son that it may not be many years before this will become a moot point. Given the rate of technological evolution, I can imagine a time not too distant when few new books are published in hard copy format. The ability to publish a new edition of a hymnal to thousands of meeting houses and millions of homes could be as simple as changing a file on a server. Perhaps I'm too optimistic about the rate of technological adoption, if not about the rate of technological advance. At any rate, I suspect that we're probably a decade away from a new edition of the LDS hymnal. I also suspect that when such a publication is released it will still include many hymns that I consider too archaic to be of much use. I'm also guessing that there will still be a smattering of numbers that are odd enough by modern standards that they end up never being seen or heard by the vast majority of church members. Even when a new hymnal is released, I will continue to find solace, edification, and spiritual enlightenment through the hymns in the book. Sacred music will continue to speak to my soul in ways unmatched by other music.